Kominka are old wooden traditional houses built approximately 100 years ago in a traditional Japanese architectural style using timeless building techniques and natural materials. The method of wood joinery structure of the central pillar and the thick beams does not use nails; instead the joints are crafted to naturally fit or “join” together naturally with craftsmanship designed to withstand the passage of time for hundreds of years if it is well-maintained. 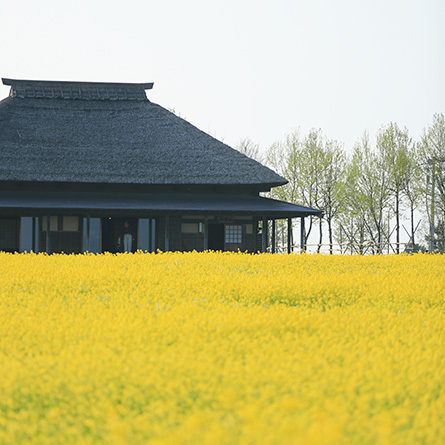 Kominka recreates various traditional lifestyles from more than 100 years ago, with such structures as farmhouses, samurai residences, merchants’ homes, and residences of wealthy families. Until recently, many Kominka were dismantled since they were vacant dwellings and new houses were built. 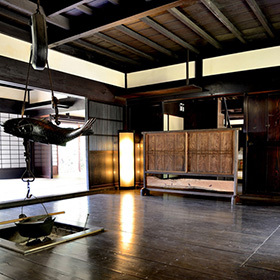 However, of late the increasing recognition and appreciation of Japanese historical and architectural heritage have inspired a new awareness of its rarity and an interest in preserving this unique architectural style of house that reflects Japan’s rich past. Our Kominka offer comfortable living by seamlessly integrating modern appliances in the kitchen and bathroom by home improvements while keeping the traditional structure and the scenic views. Renovation can also prolong the life of the house and enhance existing structural safety. *　We are happy to provide customized earthquake-resistant design for each Kominka house at the client’s request. A Kominka is a wooden traditional architectural structure built more than 100 years ago. 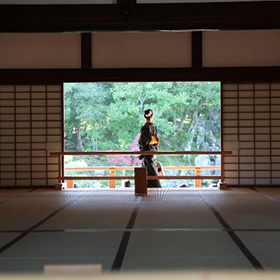 The use of tatami provides a feeling of being surrounded by traditional atmosphere of Japanese culture. 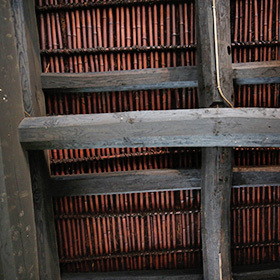 The ceiling of a 100-year old Kominka has a large, thick “hari” in the ceiling. 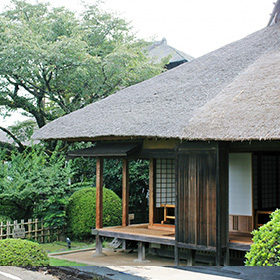 They create a splendid appearance and atmosphere in Japanese architecture. Living with a decor filled with genuine furnishings and decorations from more than 100 years. Many Kominka are found in rural regions like Kameoka and Nantan that have retained the simplicity of country living. Nowadays living in natural surroundings has attracted a great deal of attention for a variety of reasons. The elegant simplicity of rooms in a Kominka engage people's hearts and minds. 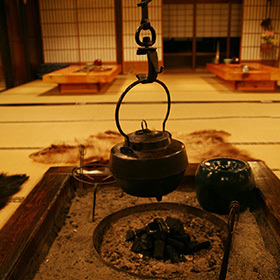 A family that spent years traveling around the world came to find a peaceful lifestyle in a Kominka in the Nantan countryside near Kyoto, a city that retains the feeling of the past. Ken Yonetani, a contemporary Japanese artist, and his Australian wife, Julia. The family purchased a Kominka in Nantan, Kyoto Japan from Nakagawa Jyuken and moved into there in 2015 after living life on the move throughout the world in Germany, France, Finland, Turkey and Singapore. Nakagawa: What was the reason you chose the permanent life in Nantan City ? We basically did not like the urban life but needed the convenient transportation access due to my occasional overseas business trips. When we were in Okinawa, we found Nantan City ,which is located in a rural area, but is convenient for the access to major cities and the Internet. 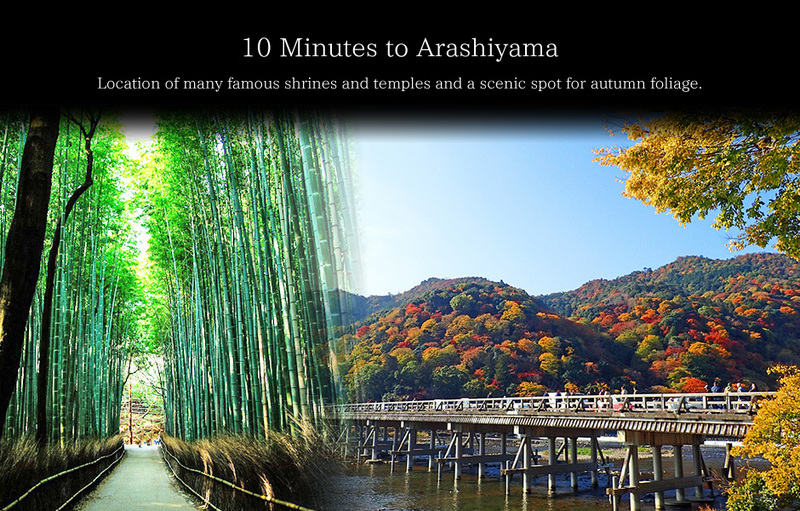 Where we live know is called a rural area in Japan, however where we can get to the city in just 30 minutes. So, it really does not seem rural to me at all. When I was living in Australia, it took over 2 hours to go 140 km distance from my home to the city. In comparison with that situation, this place is absolutely not a rural area. Nakagawa: What drew you to Kominka? This is a historic place, about 400 years old, which you can tell from the attic that still has a thatched roof and thick wooden pillars that remain unchanged. It has a beautiful patio. It is just like a Mediterranean house with a place to get together. Our children are enjoying the country life while enjoying what the natural life by the river and without any worries about the traffic. Although we might have continued a nomadic life if we didn’t have children, we want our children to be able to go to just one school without changing school very often. They are completely accustomed to living here by playing with the same aged children. Nakagawa: I heard that you have taken over the farm land from a former owner and started farming yourself. It came as a surprise to people around here that we were going to farm this large land by ourselves with no experience. We tried to farm by hand at first, but it took too long so we gave it up! (Laughing.) We borrowed an agrimotor and got advice from neighbors to get it going. Their lifestyle includes enough time for creative activities, farming, and raising their children in the country. 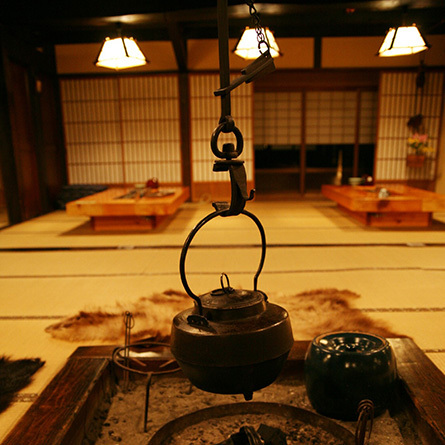 What is life like in a Kominka in Nantan or Kameoka in Kyoto? 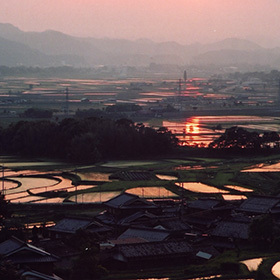 Both Nantan and Kameoka have become desirable locations because they are less than 20 minutes away from the amenities, culture, and all that Kyoto has to offer; yet they retain all the benefits of a rural lifestyle, including the scenic views. One of the world’s most highly visited historical cities with many architectural treasures-near Kinkaku-ji Temple, Kiyomizu-dera Temple, and Fushimiinari-taisha Shrine. 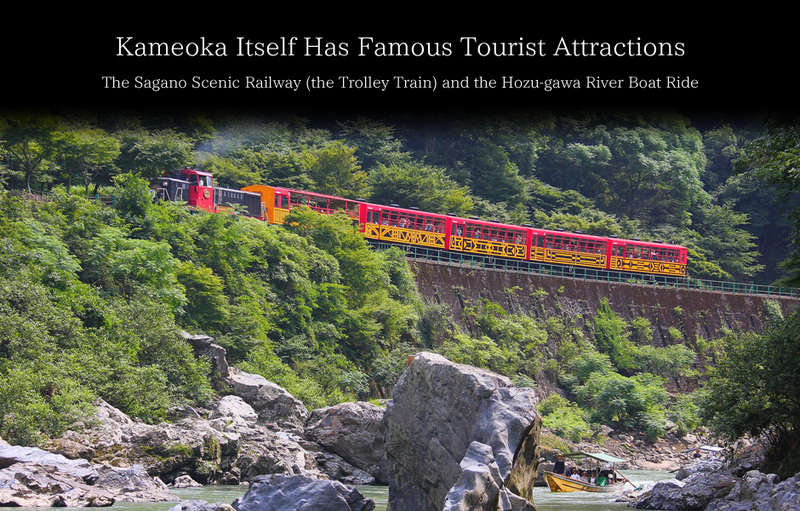 A delightful sightseeing train line drawn by a diesel-electric locomotive running along the Hozu river between Arashiyama and Kameoka offers fantastic views of nature and the gorge. 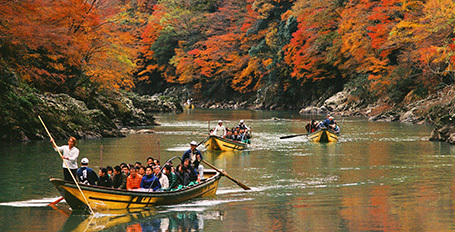 The Hozu river, with its depths and rapids, reflects four seasons on its surface along the ravine from Kameoka to Arashiyama and gives you a thrilling two-hour trip. This festival takes place every year in October. 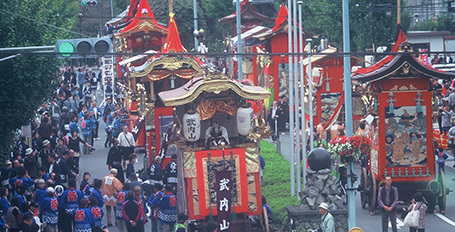 The picture above shows "yamahoko" (decorative floats) which are the main feature of the festival. Rows of many stalls are found and floats are decorated with lanterns on the street at night. You can see the spectacular sight of floats which are towed by many people through the city streets on the last day of the festival. This is the memorial festival for Mitsuhide Akechi, the first lord of Kameyama Castle, of which only the ruins remain. 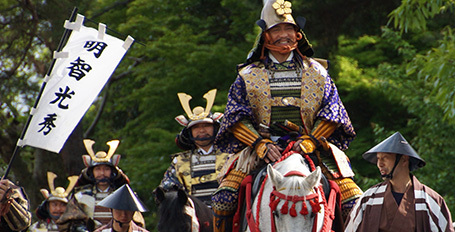 Local participants parade through the downtown dressed in costume of Mitsuhide Akechi and don Yoroi armor and Kabuto helmets for a historical re-enactment. It is open every fall. 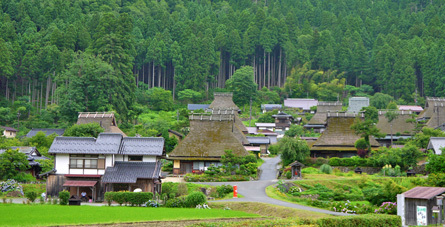 A lot of thatched roofed homes by the traditional building techniques exist here. 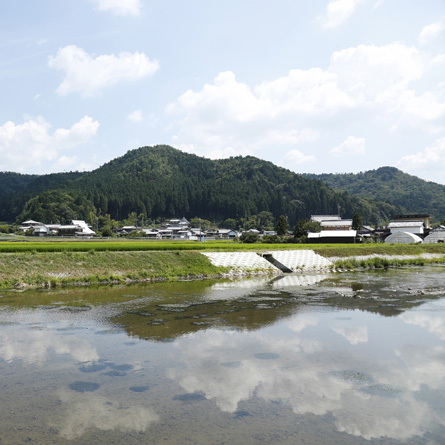 It is the very famous tour spot representing Miyama town where we can meet the original scenery of Japan in year around. 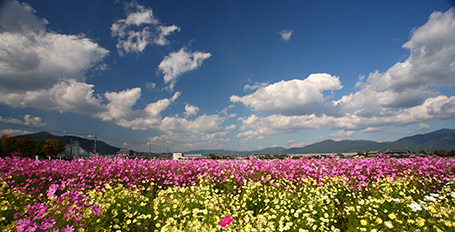 "Fireworks festival in Nantan city" is held every summer. 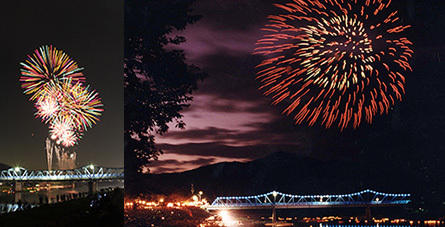 Fireworks are set off from the riverside of OOI River and it is an amazing secene where a few thousands of fireworks light up the night sky. 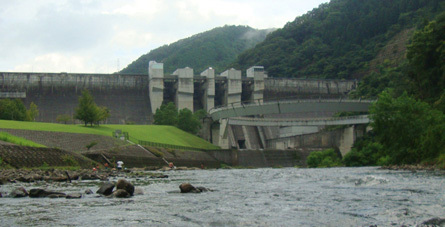 Powerful appearance of dam and touring inside the dam is possible. 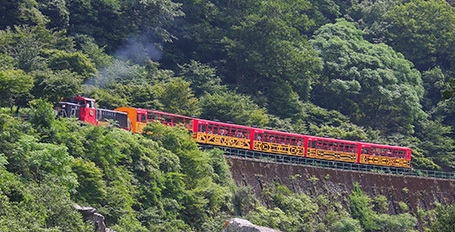 Road station with the natural hot springs is located just under the Hiyoshi dam. 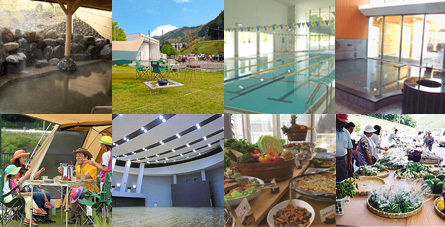 You can enjoy hot springs, bedrock bath, heated pool, restaurant, local vegetables, souvenirs, gymnasium, golf, foot bath, and BBQ there.